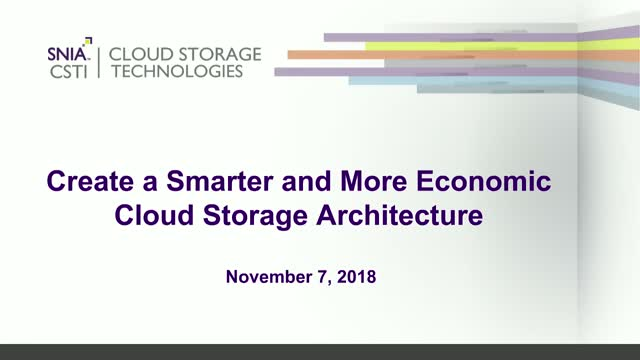 Building a cloud storage architecture requires both storage vendors, cloud service providers and large enterprises to consider new technical and economic paradigms in order to enable a flexible and cost efficient architecture. Cloud infrastructure is often procured by service providers and large enterprises in the traditional way – prepay for expected future storage needs and over provision for unexpected changes in demand. This requires large capital expenditures with slow cost recovery based on fluctuating customer adoption. Giving these cloud service providers flexibility in the procurement model for their storage allows them to more closely align the expenditure on infrastructure resources with the cost recovery from customers, optimizing the use of both CapEx and OpEx budgets. Clouds inherently require often unpredictable scalability – both up and down. Building a storage architecture with the ability to rapidly allocate resources for a specific customer need and reallocate resources based on changing customer requirements allows the cloud service provider to optimize storage capacity and performance pools in their data center without compromising the responsiveness to the change in needs. Such architecture should also align to the datacenter level orchestration system to allow for even higher level of resource optimization and flexibility.